In February 1945, the Allies launched Operation Thunderclap, a series of maximum efforts against cities in eastern Germany, partly to pave the way for the Red Army that would soon be overrunning that territory. These deep-penetration raids would tax the bomber crews immensely, as well as bring new devastation to cities yet untouched by U.S. 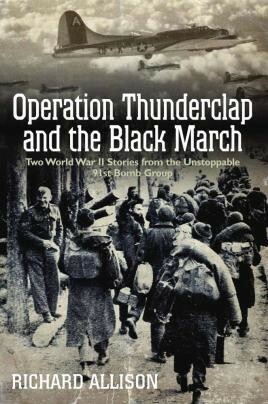 Unfortunately, due to sales rights restrictions, we cannot offer Operation Thunderclap and the Black March for sale in your country. In February 1945, the Allies launched Operation Thunderclap, a series of maximum efforts against cities in eastern Germany, partly to pave the way for the Red Army that would soon be overrunning that territory. These deep-penetration raids would tax the bomber crews immensely, as well as bring new devastation to cities yet untouched by U.S. airpower. Two B-17 crew members, a co-pilot and gunner, trained together in Gulfport, MS, and in fall 1944 were assigned to the longest-serving and most decorated U.S. bomb group in England. However, their paths then diverged. The co-pilot flew 31 missions until war’s end; the gunner was shot down and captured on his very first combat mission. These crew members both lived—one through Thunderclap and one through the Black March—and this is their story: an account of both constant air combat and travail on the ground. This work includes a firsthand view of the bombing of Dresden, perhaps the worst cataclysm inflicted by bombers in the West. The co-pilot participated in these attacks, where he witnessed a city already too far destroyed to expend additional bombs. Meantime the gunner, shot down and parachuting into enemy territory, was taken prisoner by the Germans, and then forced to endure “The Black March,” an effort by the Nazis to move all their prisoners beyond the Red Army’s advancing spearheads. Of 6,000 Allied POWs put on the roads from northern Poland, in a 500-mile, three-month trek, a quarter died due to the elements, disease and starvation. The gunner survived the March, and once the sands ran out for Germany experienced a period in Soviet captivity. During the day he thought their men behaved; but after dark there was chaos as the Red Army wreaked its revenge. This unique book on the Allied air campaign offers new insights into what these fliers truly saw and experienced during the war.